Dear Media Partner: Welcome to the 33rd Annual Governor’s Hurricane Conference! 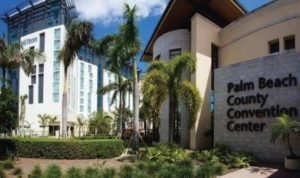 The 33rd Annual Governor’s Hurricane Conference will be held at the Palm Beach County Convention Center, located in West Palm Beach, Florida. The dates for this year’s conference are Sunday through Friday, May 12-17, 2019. This year’s theme, order now “Road to Readiness”, provides attendees an opportunity to focus on the many significant changes in hurricane planning and new methods to best prepare Floridians for a hurricane or tropical storm. We invite you to cover the more than 1,600 emergency managers and personnel, first responders, state, federal, volunteer agency, business and industry representatives, along with health and medical professionals from around the state, nation and world. These individuals will come together during the week’s scheduled 40+ training sessions and almost 50 workshops and panel discussions to train and learn from each other. As in past years, the Media Room will be an important offering as part of our conference. We are here to help you and your media organization make the best use of your time and resources for coverage of the week’s activities. The Media Room is located on Level 1 in the northwest corner of the Palm Beach County Convention Center, in Room 1J/1K, which is right around the corner from the exhibit hall. http://theartmag.com/ over the counter birth control Media Room Hours of Operation: Monday, May 13 – 8:30 a.m. to 5:00 p.m. Tuesday, May 14 – 8:30 a.m. to 5:00 p.m. Wednesday, May 15 – 8:30 a.m. to 5:00 p.m. Thursday, May 16 – 8:30 a.m. to 5:00 p.m. Friday, May 17 – 8:30 a.m. to 12:30 p.m. Your feedback will help us greatly in providing the best service to your organization now, and throughout the conference week. Again, please take a moment to pre-register and send us your media organization’s best guess in terms of what you anticipate your plans will be. 3. All current information about conference training sessions, workshops, roundtable discussions and general sessions are available via the Program page of this site. Information on interviews, press conferences, and Q & A sessions with conference speakers and other entities will be provided via this Web page, as they become available. Interviews will be held in the Media Room’s closed off interview area, a designated quiet area near the Media Room or external locations, as available. Florida Governor Ron DeSantis; Jared Moskowitz, Director, FDEM; Ken Graham, Director, National Hurricane Center; Chief Joby Smith, Bay County Emergency Management; Adam Johnson, Interim Director Calhoun County Emergency Management and others have been invited to speak at the General Session, to be held Wednesday, May 15 at the Palm Beach County Convention Center Grand Ballroom. For interviews with National Hurricane Center Director, Ken Graham (interviews will be held either in the Media Room or nearby), contact Public Information Officer Dennis Feltgen at (305) 229-4404 office, (305) 433-1933 cell or dennis.feltgen@noaa.gov. Lastly, and most importantly, media representatives must carry media credentials. Upon arrival, please proceed to the Media Room to register and be issued a conference MEDIA badge for access to all public conference venues. Thank you for taking the time to help in this effort, I look forward to seeing you soon!